This listing is for a 3 piece set of the very popular and highly collectible pink Spode's Tower by Copeland demitasse luncheon set. I have 6 sets of these pretty cups, saucers, and salad plates. You may purchase an individual set, several sets, or the entire 18 pieces. The pieces are in excellent vintage used condition with no chips, cracks, crazing, or scratches. Spode is one of the oldest and most distinguished of the great pottery companies of Staffordshire, England. The firm’s blue and white bone china transferware is a timeless classic. The company was established in 1770 in Stoke-on-Trent by Josiah Spode, a friend of the enigmatic English ceramist, Josiah Wedgwood. 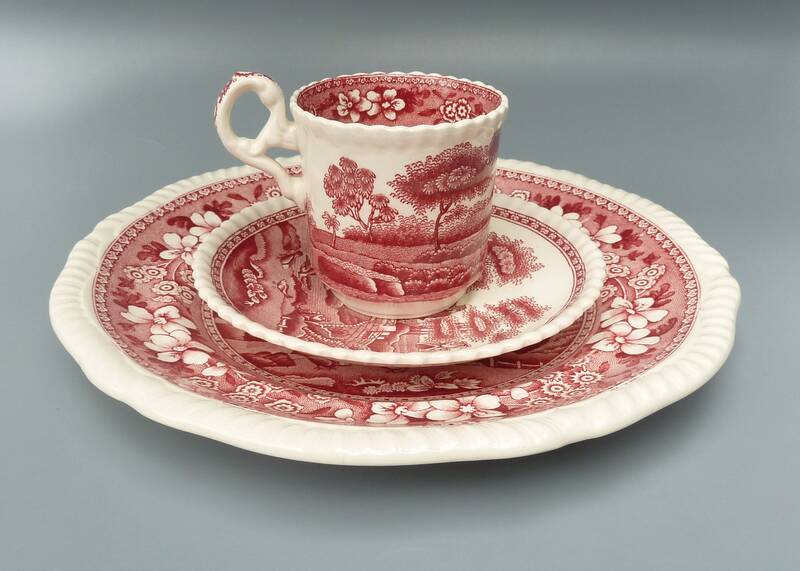 Spode was particularly known for two technical achievements in the manufacturing of porcelain. The first was to develop a standard formula for the making of bone china, a type of porcelain made with a mixture of bone ash, minerals and clay that is dazzlingly white and very strong. The other was to perfect the making of transferware which is a process that involves the transfer of pictorial images inked on tissue paper onto ceramics that are then sealed with a glaze. In 1833, following the sudden death of Josiah Spode III, his business partner W.T. Copeland took over the company and changed it's name to Copeland. Each demitasse cup stands 2-1/4 inches high and the saucers are 4-3/4 inches wide. The salad plates measures 7-3/4 inches in diameter. All pieces are stamped with the older oval shaped backstamp "Copeland Spode's Tower England". Shipping and handling price is for USPS Domestic Priority Mail which includes Tracking and Insurance up to $50. If you would like to have this item shipped to Canada or Europe, please convo me for pricing. ***Please note that since this is a used collectible item, it is being sold as is and is therefore not returnable.